Chase Utley hits an RBI single against the Cubs in the seventh inning. Ryne Sandberg loves the way Chase Utley plays the game. The Phillies manager says the second baseman reminds him of the way he used to play during Hall of Fame career. So of course Utley delivered on a blustery day at Wrigley Field. Utley hit a two-run homer and an RBI single, helping Philadelphia beat the Chicago Cubs 7-2 on Friday in a historic home opener at the majors’ second oldest ballpark. John Mayberry Jr. also had a two-run drive for his fourth career pinch-hit homer as Philadelphia bounced back after dropping the last two games of its opening series in Texas. Ben Revere and Domonic Brown had three hits apiece, and Brown also drove in two runs. The Phillies also got a strong outing from Roberto Hernandez, who pitched into the sixth inning in his first game after signing a $4.5 million, one-year contract with Philadelphia in the offseason. Welington Castillo hit a solo homer for the Cubs, who have dropped four consecutive home openers for the first time since 1991-94. Travis Wood (0-1) struck out eight in 6 1-3 innings, but was charged with four runs, three earned, and six hits. Wrigley Field was all dressed up for the first game of its 100th anniversary season. There were big blue banners on each side of the red sign that welcomes visitors to the beloved ballpark, and fans headed to the outfield bleachers strolled past historical pictures from the Cubs’ longtime home. The crowd of 38,283, wearing jackets and winter hats for the chilly afternoon, roared when Sandberg joined fellow Cubs Hall of Famers Ernie Banks, Ferguson Jenkins and Billy Williams on the mound for a ceremonial first pitch. Banks, Jenkins and Williams drew more cheers when they sang ”Take Me Out to the Ball Game” during the seventh-inning stretch. The Cubs are still waiting for that year. They last won the World Series in 1908, and many of their fans are more interested in the prospects in Chicago’s touted farm system than the players on the major league roster. Chicago got off to a nice start when Castillo went deep in the second inning and Starlin Castro singled home a run in the third, but that was it for the Cubs’ offense. 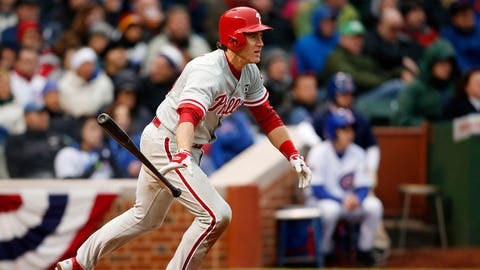 Utley’s first homer of the season, a drive to right-center in the fifth, gave the Phillies a 3-2 lead. He also singled in Ben Revere in the seventh. It was more than enough for Hernandez (1-0), who allowed two runs and three hits while throwing only 73 pitches in 5 1-3 innings. Sandberg said Hernandez hadn’t pitched to hitters for nine days because of a weather-related backup, and he pulled the right-hander when his velocity dipped in the sixth.